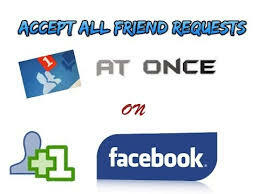 Home Facebook Accept All Friend Request On Facebook In One Click. As we all know how fastly Facebook is spreading in this world, today we all want to make new friends and chat with new people that's why Facebook is the best way to chat with new people. So to find new people we send friend requests to them and then they have to accept it. But sometimes we got really huge amount of friend requests. All of us wants to become famous on facebook and want lots of likes and comments on our stuffs like profile pictures and status, So to get lots of like we have to add lots of friends. When we get lots of Friend requests with the help of any trick which we have discussed before. Then we need to know how to accept all friend request on Facebook. Hufff that was really damn.... I think I need to sleep now 😂 lol wait let me complete this post. Step 1 :- First of all Login to your Facebook account. Step 2 :- Now in notifications menu you will see how menu friend requests you have (as where you usually check your friend requests), Click on it and then click on show all friend requests. Step 3 :- Now just press ctrl+shift+J on your keyboard or you can press f12 either. Step 4 :- Now you will see a new bellow half window will open in front of you, just click on "Console" tab (probably last one). Step 5 :- Now copy this bellow given code and paste it on Console tab which you have opened in above step. Step 6 :- Now just press enter. That's all now it will automatically accept all friend request in one click or we can say in one enter 😀.